Want to be notified of new releases in intelequia/GAB2019ScienceLab? To quickly deploy the science lab using Azure Container Instances, click on the button below. If it's your first deployment, we strongly recommend to read the instructions below. This project contains all the source code for the Global Azure Bootcamp 2019 Science Lab. 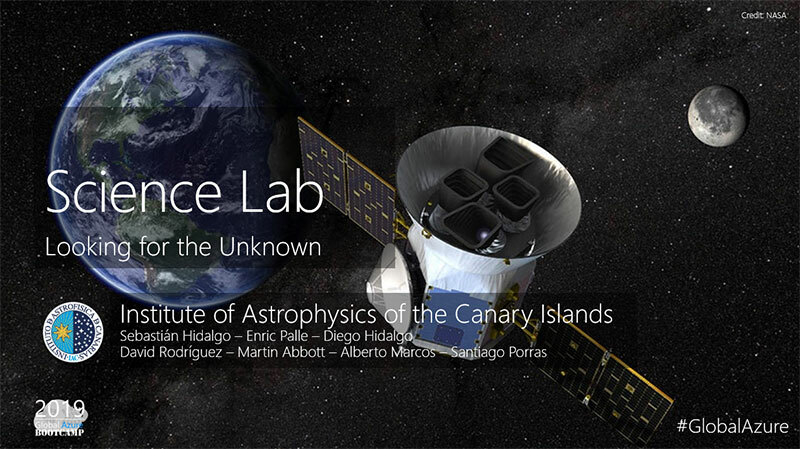 Created by David Rodriguez (@davidjrh), Martin Abbott (@martinabbott) and Santiago Porras (@saintwukong) for the Global Azure Bootcamp 2019 Science Lab running Enric Pallé, Diego Hidalgo and Sebastian Hidalgo's Machine Learning algorithms for exoplanet hunting at the Instituto de Astrofisica de Canarias using TESS mission data from NASA. An active Azure subscription. The easiest way to deploy the lab is by using Azure Container Instances. You will need an active Azure subscription to deploy the containers on Azure. You can signup for a free subscription here or use the Azure Passes shared on the Global Azure Bootcamp event. The easiest way to deploy the Science Lab is by using Azure Container Instances. We have prepared a resource manager template that simplifies this step, by asking you some parameters that are used in the container that will be used later on the Global Dashboards for statistics and for fun. Fill the form. You can get info about each field if you hold the cursor over the info icon. LabKeyCode: Is a predefined string with your location LAB Key. Ask admin staff at your location for the code. If you don't know any, just use THE-GAB-ORG as key. Click on the Accept the Terms and Conditions checkbox, and relax waiting for the green check. Will take around 5 minutes to complete. Once the lab has been deployed, you will see a set of resources under the resource group, one per container instance group. Each group will container just one container instance. Click on one of the container instances, and get the public DNS name from the General Settings area. Ouputs Uploaded: a green light indicates that is working properly. Every 10 seconds a background process checks if there are outputs ready to be uploaded to the GAB server. There is also a log area where you can check what is happening inside the GAB client. Each input takes around 5 minutes to be processed by a container (pipeline 1 + pipeline 2 execution times). 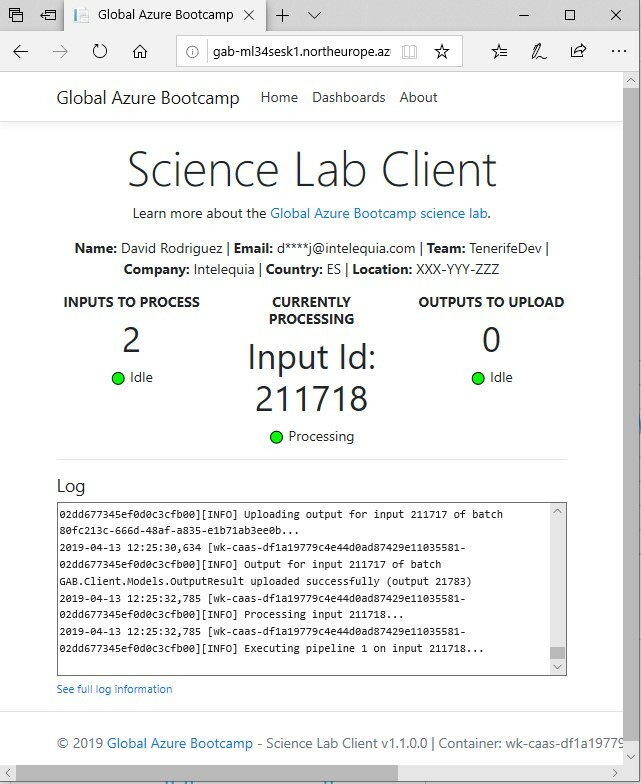 After the input is processed, it goes to the upload queue, and once uploaded, you start appearing on the Global Azure Bootcamp Science lab Dashboards, available at https://gablabdashboard.azurewebsites.net. Your lab deployment will continue working processing inputs until you delete the deployment resources. Note that this year our intention is to continue processing information after the GAB day. Thanks for your support on Global Azure Bootcamp 2019 Science Lab. Live Long and Prosper! The lab uses an Azure Container Instances. The cost of each ACI is around $1 for a full day (consumption 1vCPU and 1GB RAM over 24h). How many instances can I deploy? If you are deploying the lab using Azure Container Instances, there is a limit of 60 ACIs per Azure Subscription. You can deploy more than 60 if you use more subscriptions, but please, do the maths following FAQ #1. Remember you can also deploy the science lab on your own laptop or on any other Docker powered environment. Can I start crunching data before April 27th? You can deploy the lab before April 27th just for testing purposes, but note that we will reset all the data, stats and dashboards on April 27th. Can I continue processing data after April 27th? Yes, this year we want to continue hosting the Science Lab after the Global Azure Bootcamp day. Our intention is to continue processing data until the end of the TESS mission. This downloads the science lab client image and runs it on a container instance. If you browse http://localhost:8080, you will notice how the science lab is progressing. Search the container id by executing the following command and writing down the container id with the name "globalazurebootcamp/sciencelab2019:latest"
This is because we needed to break the backwards compatibility with the previous client, and you need to redeploy your container. 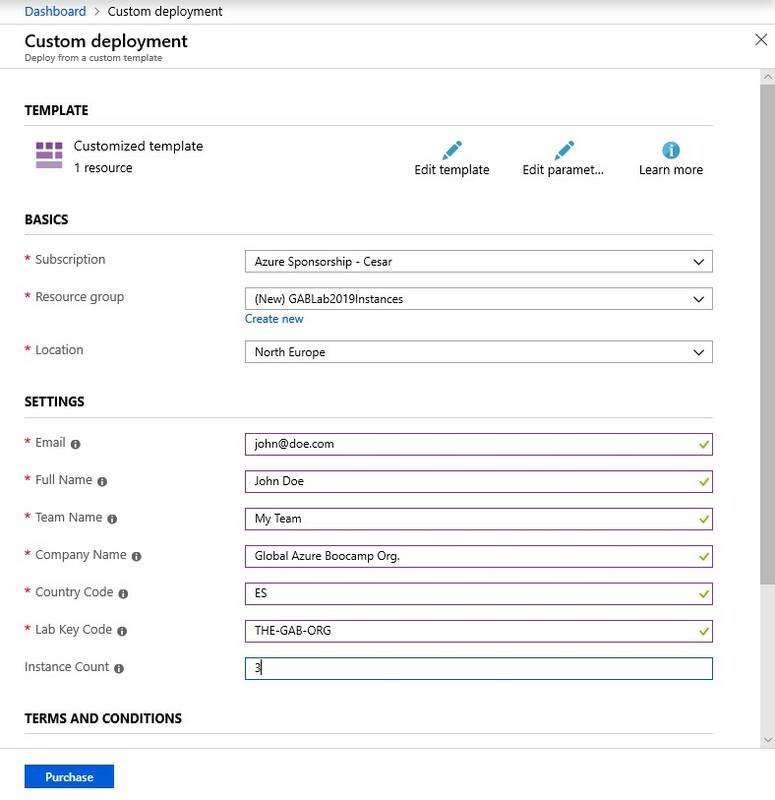 When running on Azure Container instances, this can be easily accomplished by clicking on the "Restart" button available on the Overview section of your container when using the Azure Portal.